Barnegat Light is on the northern end of Long Beach Island. Located adjacent to what was the infamous Barnegat Inlet before a multimillion dollar Corps of Engineers project brought it's fierce currents somewhat under control, Barnegat Light's two commercial docks service a fleet that ranges from small, local day boats to globe spanning longliners. Several fishermen in Barnegat Light pioneered the deep water tilefish fishery back in the 1970s and through a successful marketing campaign turned this delicious fish into the consumer's "poor man's lobster." Along with Montauk on the Eastern end of Long Island, Barnegat Light is still the center of this valuable fishery. 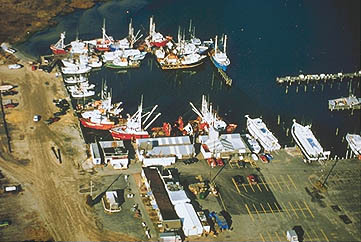 Barnegat Light is the home port of many members of the East Coast's longline fleet. Targetting several species of tuna as well as swordfish (see the page on longlining in the "Fishing Techniques" section), on their several week or longer trips Barnegat Light longliners routinely fish from the high seas from hundreds to thousands of miles away. 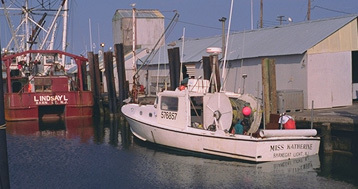 Barnegat Light is also home to several state-of-the-art scallop vessels and a fleet of smaller, inshore gillnetters.